Stone above rock: a free-standing single wall above jointed granite, separated by a glacially scoured surface and a thin soil. 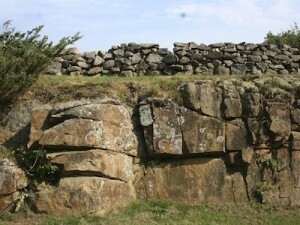 The wall is part of the “stone domain” as defined here. The rock is not. Kennebunkport, ME. There are seven hierarchical ranks within the this provisional stone taxonomy. The most inclusive rank, “universe,” is informally defined only so that the “stone domain,” the next-most inclusive rank, can be isolated from it. Below the level of the stone domain, each of these taxonomic ranks –class, family, type, and subtype– are explicitly defined and are analogous to the groupings of the Linnaean taxonomy for life forms. At the most specific level of classification, the variability is too great to specify a taxonomic rank. Instead, we recommend using a consistent set of descriptors (modifying labels) equivalent to the “Var” (variety) name in the Linnaean taxonomy. There is one universe of bulk material culture. Cobbles on a beach. Though made of stone, these are not part of the stone domain because they are not cultural, per se. Metal of its girders, stakes, hinges, braces, tools, etc. The idea is to create a parallel universe of material culture that is separate from the universe of objects that have already been extensively studied by historic archaeology: for example the objects of domestic life such as ceramic plates, tobacco pipes, silver spoons, bedding quilts, chamber pots, musketballs, and so forth. There are five domains in the one universe of bulk material culture, only one of which is of interest here. Fiber, metal, forest, wood, and earth, are excluded from the stone domain. Rubber didn’t exist during the time period of interest. Having isolated a separate “outdoor” material universe, the next step is to isolate the the component built of stone from the other components, for example the wood, earth, fiber, and metal described above. To this component, I give the name “stone domain.” Specifically, it includes all groupings of stones, most commonly stone walls and stone piles, and individual stones that set apart from others, perhaps due to their size, shape, and position. most commonly they are carved stones, standing stones and glacial erratics. The stone domain specifically excludes ledge and bedrock outcrops, and undifferentiated stone within the soil. A domain is analogous to phylum in the traditional Linnaean taxomony. Class, the highest grouping within the stone domain, equivalent to the highest level below order in the Linnaean taxonomy. Family, the highest grouping within each class, equivalent to the highest level below class in the Linnaean taxonomy. See below. Types, is the highest grouping within each family, equivalent to the level sub-family in the Linnaean taxonomy. See below. Subtypes, is the highest grouping within each type, equivalent to the level genus in the Linnaean taxonomy. Not all types are given subtypes. See below. Descriptors (Informal), describing in sequence the: condition of preservation, order of stone placement, characteristic shape and size, source of the stones, and architectural structure. For example, the wall I see most often, just east of my house, is a heavily collapsed (condition), crudely stacked (order), slabby (shape), fieldstone (source), double wall (structure). There are four classes in the Stone Domain. 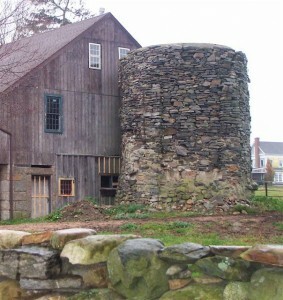 Features like this stone silo in Stonington, CT force an arbitrary distinction between the class “stone wall” and the class “stone concentration” within the stone domain. 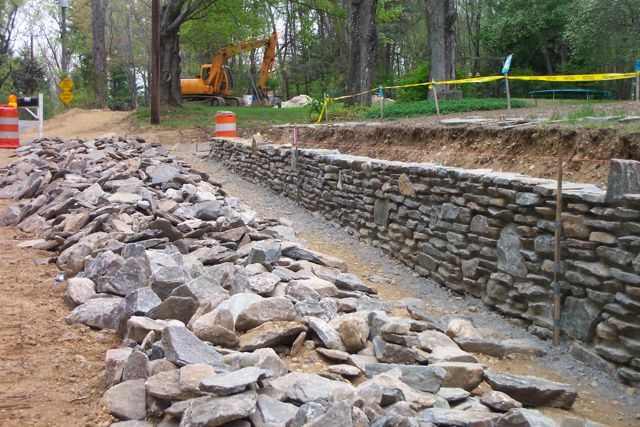 The Class Walls are typified by the classic New England fieldstone wall, and related foundation and mill-dam walls. They meet the three fundamental criteria of elongation, continuity, and elevation. The Class Rows are typified by the spaced lines of boulders protecting yards from vehicle traffic, as well as the low stones along borders of gardens. Rows satisfy the criterion of elongation, but fail either the criterion of continuity (by having gaps) or the criterion of elevation (by being too low). The Class Concentrations are a broad group that includes piles and monuments. Usually they are differentiated from walls because they aren’t elongate enough. Finally, The Class Notable Stones is typified by the isolated boulders or quarried slabs so frequently adorning new construction. Gravestones and grinding stones also qualify as stones, provided they are considered individually. Each class is subdivided into families that are distinguished by features that can be observed in the field, but which are named more generically based on their purpose or relationship to the soil. There are seven families within the class walls. These two walls are in different families. The elongate pile is in the class “freestanding walls” because it has two visible sides. The carefully laid wall being built from the pile is currently a freestanding wall, but will soon become a “flanking” wall when it becomes a retaining wall for the “earth” behind it. The Family Freestanding Walls stand above the ground surface (grade) on both sides, or nearly so. Here, the focus is principally the segment rather than the enclosure. 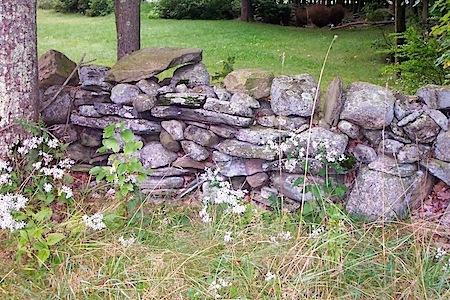 A classic fieldstone wall is a familiar example. The Family Flanking Walls are embedded into the slope, meaning that one side is intentionally higher than the other. They stabilize terrain by physically supporting the soil on the upslope end (retaining walls), and (or) by protecting it from erosion. The Family Raising Walls are built to raise the ground surface above grade on three or more sides, either with a single continuous curved wall or series of segments. A raised garden bed is the most familiar example. The Family Impoundment Walls are built to hold back water, rather than soil. The stonework around a classic mill dam is the most familiar example. The Family Foundation Walls are built to hold up structures, usually wooden buildings such as houses, barns, and sheds. Many serve a subsidiary purpose as retaining walls. The Family Confinement Walls are small enclosures in which the focus is on the enclosed space, rather than the segment. The town pound is a familiar example Normally, such walls are un-roofed, though they need not be. Stone chambers and New England’s rare stone houses fall into this category as well. There are two families within the class Rows. A Solid Row is a continuous (not spaced) line of abutting stones too low to be considered a wall. Typically they are cobbles or small boulders used as a border. A Spaced Row is a line of stones that are not abutting. Typically, these are high enough to qualify as a wall, but fail to meet its criterion of being continuous. A dashed row has less space between the stones than the stones are wide. A dotted row has stones further apart than their width. There are three families within the class Concentrations. Stone Surfaces are concentrations of stone that abut one another side to side, but are not stacked. Outdoor patios and walkways and veneers of stone which protect against erosion, are the most common types. Stone Uprights are deliberately built concentrations created for a variety of purposes, including monuments (stacks, cairns, and survey markers), pillars (which support objects from below), and chimneys. Stone Piles include a variety of un-stacked mounds and heaps, ranging from the filled corners of many walls to those covering Native American burials. 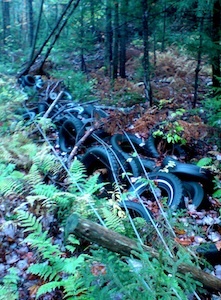 It also includes ring-shaped piles, which grew up surrounding trees and wooden fence posts. There are two families within the class Notable Stones. Standing Stones are generally unadorned, elongate in shape (length must be more than three times width/thickness), and their lengths are perpendicular to the ground, or nearly so. Most were deliberately inserted into this geologically unstable position, but are few are natural. These are divided into two types. The type Modified stones were shaped with tools in some way (grinding, engraving, hammering, etc.). The most common examples include quarried granite posts and gravestones. The type Unmodified bear no tool marks of any kind. Stable Stones are notable stones where the center of gravity is just above the ground. There are two basic types: glacial erratics which have some cultural significance but which have not been moved, and placed stones, which have been moved. Placed stones are further subdivided into subtypes, quarried and un-quarried. 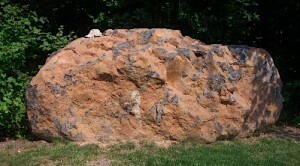 An unquarried (subtype) placed (type) stable (family) notable stone (class) of rusted basalt in Avon, CT.
A boulder (subtype) dashed (type), spaced (family) stone row (class). This would be a dotted row if the spaces were larger than the diameters of the stones being placed. It would be a stone wall if the stones were abutting because it would meet the height requirement. 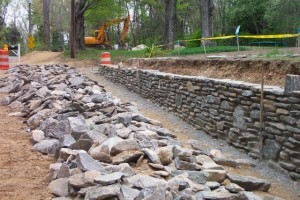 Descriptors: A partially collapsed, mixed-stone, well-laid, one-tiered, uncapped single fieldstone wall. There is always a need to describe individual objects at a higher resolution than the taxonomic rank allows. For example, tall and short varieties of the species Homo sapiens. Consider the case of the classic double wall found gracing long-established farmsteads throughout New England. This is an informal subtype (classic) within a type (double), within the family (freestanding), within a class (wall). It could be mortared, or un-mortared, built of fieldstone or quarrystone, or be capped or uncapped. To encompass all of these common features in a single taxonomy would require a minimum of eight different variants, making the taxonomy too cumbersome to use. Hence, the descriptors below. Condition: Intact, partially collapsed, collapsed, etc, in decreasing preservation. Degree of Order: Embellished, laid, stacked, or dumped, in decreasing order. Stone Shape & Size: For example, slabby, blocky, bouldery, cobbly, etc. Stone source: Quarried, culled, or unculled fieldstone. Structure: Double or single, one-tiered or X-tiered, capped or uncapped, etc. Function: Foundation, retaining, or pen, etc. Bedrock, such as this schist in Bolton, CT, is not part of the Stone Domain as defined.